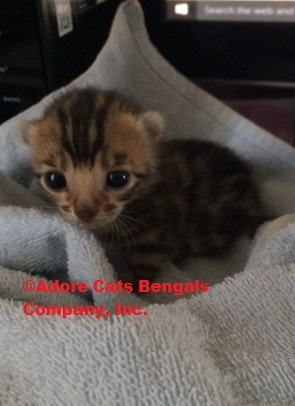 Belle’s Female Bengal Kitten at 2 weeks old. This kitten was two weeks old in this photo. Kittens are born with their eyes closed. So when this little girl finally opened her eyes, we were so excited that she could not just hear us but she could finally see us too!